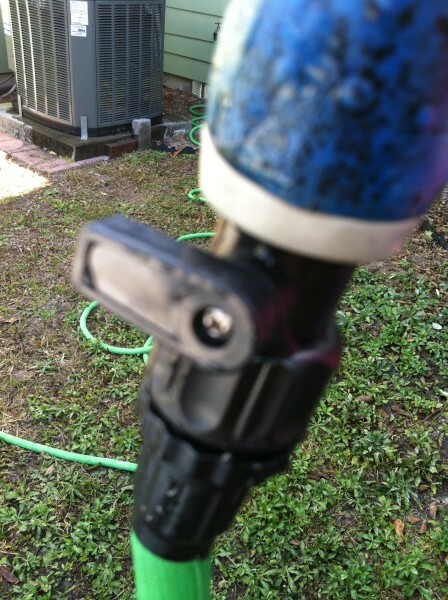 I had the opportunity to review this hose for my blog. I really didn’t know what to expect because I have never tried one of these type hoses before. When I took the hose out of the box I couldn’t believe how lightweight it was, only weighing 2 lbs. 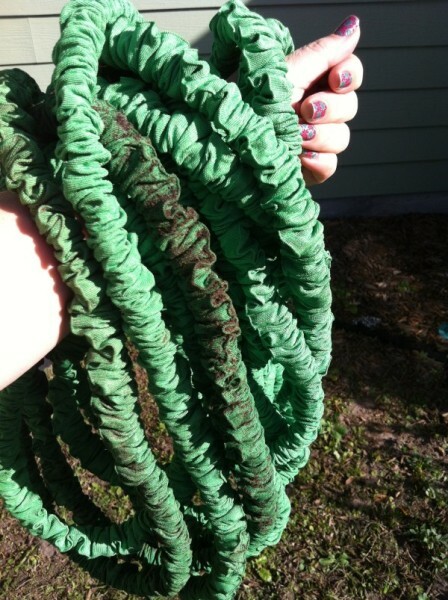 I always dreaded lugging a traditional hose around the yard, they are so heavy and cumbersome. This hose is amazing, it is soft and flexible enough to gather up and carry around anywhere you need to take it. So light I can gather it up and carry it anywhere with ease. The hose starts out 33 feet long and expands with water pressure to 100 feet, and then shrinks back down to 33 feet for easy storage. I love that this hose does not “kink” when using it, I always get a kink when I am dragging my old hose around. I also like that there is a little on and off lever on the adapter that you screw a sprayer to, its nice to be able to control the water flow from the end of the hose you are using and not have to go all the way to the faucet to turn it off while you are using it. On and off lever on the hose. You can purchase this hose from Amazon.com by clicking here. I received this hose free of charge in exchange for my blog review. I was not or will not be paid for this review and the opinions are all my own. As I am walking around the yard I think to myself how long it’s been since I have had the energy to even go outside, much less walk around. It is unbelievable how much my life has changed since I started eating organic clean whole foods and cut GLUTEN completely out of my diet, I am gluten-free and loving it! I am eating a low-carb, high-fat LCHF mostly Paleo diet trying to get my diabetes under control, and so far it’s working. I tested my blood sugar level and it was 127 mg/dl. Now that may not sound like a perfect number, but it is truly a miracle for me. For example, I looked at my calendar where I track my blood sugar readings, and on February 16, 2014 my numbers where as follows– my first reading of the day after fasting all night was 231 mg/dl, then the rest of day it only got worse– 334,476,434,492,431, and finally 343 mg/dl. I felt terrible ALL the time. I don’t ever want to go back there again! I love how I am feeling now, my mood is so much more calm and positive, and I am starting get energy and an actual desire to get out of bed, even get out of the house in the day time. It has been years since I have even gone out in the sun, and now I know how important getting a little sunlight is so my body can make its own vitamin D.
I love flowers with all their beautiful colors and fragrances, they just make me happy. I especially love finding wildflowers. I have noticed that now I enjoy walking around the yard taking pictures, picking blackberries, or even doing some light yard work or gardening. Oh yeah, and a big bonus, I am actually loosing weight. I love the new me. Here is a little slide-show of my recent photos. It looks like our vegetable garden is starting to get a white powdery mildew on some of the plants. It is important to us that our garden is organic, so I didn’t want to use traditional fungicides with all their toxic chemicals. So I looked online for an organic solution for our white powdery mildew problem. I was very happy to find a simple organic way to handle the problem. Growveg.com has an excellent blog post on using a 40% milk and 60% water solution that you spray on the plants. 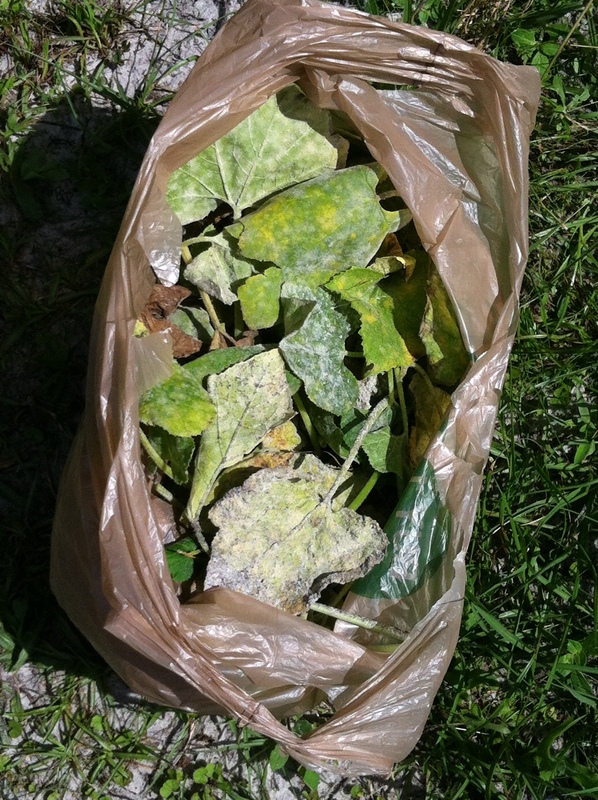 We have squash and cucumber plants which are very susceptible to getting white powdery mildew. First I trimmed off all the mildewed leaves and put the leaves in a bag and dispose of in the garbage. You do not want to compost these leaves. Then I took a regular plastic spray bottle and put the water and milk mixture in it. Supposedly it’s the protein in the milk that you need, so it doesn’t matter if you use low-fat or full-fat milk. I used full-fat organic cows milk from the grocery store, and sprayed the front and back side of the leaf, totally saturating the leaf. It says that it works best when used as a preventive measure. I’m gonna cross my fingers and see what happens. Also, I worried that it would smell like sour milk after a while, but there doesn’t seem to be a smell at all. Growing up we always had a garden. As a kid, all I knew about gardening, was that it was gonna be a lot of hard work. Of course I loved eating all those fresh veggies! Back then there were no GMO’s and I didn’t have to worry about if what I was eating was grown at home or bought in the store. Those were simpler times, things have really changed. Don’t get me wrong, progress is good, and I enjoy all the modern conveniences and advancements in technology and science. But there always seems to be a good and bad, yin and yang. Now I do worry about where my food comes from, is it organic, or is it a GMO. ( Here is an article about 10 reasons to avoid GMO’s) I feel so betrayed by the FDA that they have allowed GMO’s to be used as ingredients in so many foods we eat, without letting us know by labeling foods containing GMO’s. I am trying to eat healthy, by eating a lot of fresh fruits and vegetables now, and I want to know if they have been genetically modified. So my sister and I have decided to make a little garden of our own, just like when we were kids. Except, when we were kids, our father and mother used to do most of the tricky stuff, like when to plant , what to plant, and where to plant. So we are just planting a few things to get the hang of it again. For dinner tonight I was having a craving for our local BBQ place’s hamburger and onion rings. I know the meat and veggies will NOT be organic, but it would be quick, easy and yummy. Well, I got more than I bargained for… I also got a headache, stomach ache, indigestion, enough mucus to choke on, and a quick trip to the bathroom… that familiar old feeling. I know now that I am feeling this way because of the gluten and dairy. I dipped my onion rings in that delicious ranch dressing they give you with the rings, and had mayo on my burger, and of course I ate the bun. Now that I have cut out gluten and dairy, I can really see how it affects me. Before, I just always felt sick and just thought that was just the way it would always be for me. This was definitely a learning experience for me. I felt guilty that I gave in to my cravings, but now I can see that I have learned from it. I know we can’t always be perfect, and it’s ok to slip up now and then, but I will remember that maybe it wasn’t worth how bad I feel now. Onion rings are definitely a weakness, I love them! So, now I just have to come up with a gluten-free recipe so I can still have them. Onions are so good for us, click on the link to find out more about the health benefits of onions. I love the little green onion or scallions, I cut the root part off and saved it and replanted it to see if it would grow some new onions and it looks like it worked… YAY! 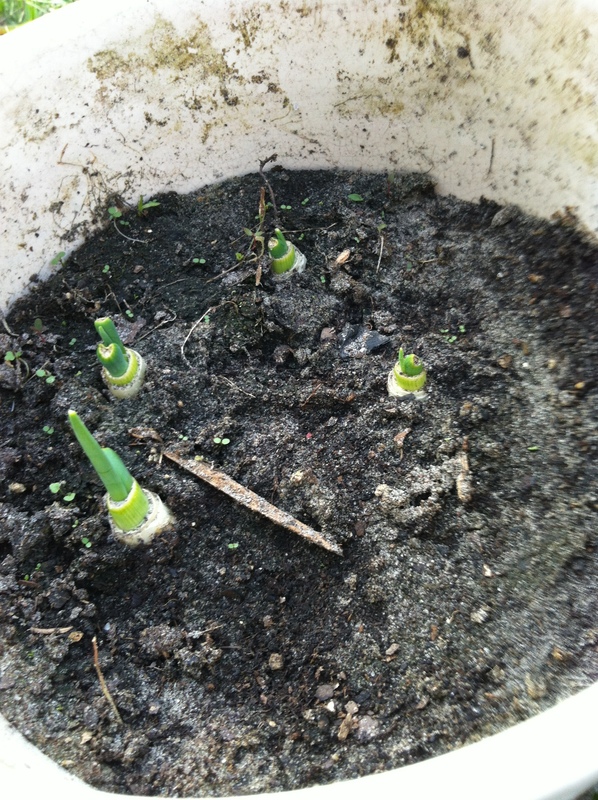 Replanted the bottom root portion of my organic store-bought green onions.